What’s Jewish about butterflies? Or spiders or potato bugs? The Kofim class of three-year olds has always been a curious bunch, full of questions and ready to search out the answers. 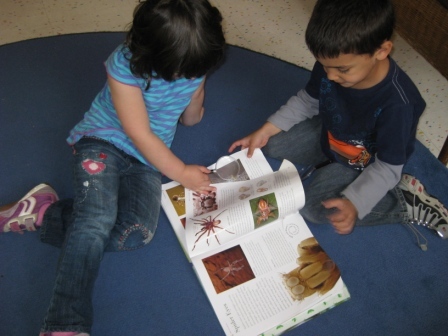 Since our school uses a Reggio-inspired, emergent curriculum, following the students’ interests and using those to construct learning opportunities, Amanda and I were hopeful that a class exploration of animals might lead us toward the National Zoo. The kids’ interests, however, were steering us in a much different direction: down. 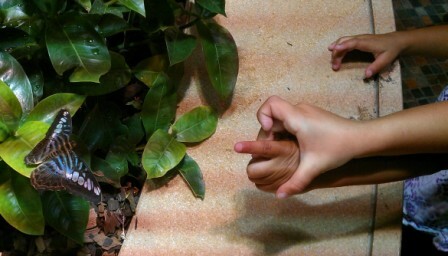 As we walked around our neighborhood, the creatures that most captured the kids’ fancies were at ground level: bugs! As adults, it is much easier to see what is at our own eye level and above; for these kids, a shrub with a spider web tucked inside IS at eye-level and is an absolutely amazing thing! The Kofim were into bugs. We amassed a collection of clear containers (with lids) that were good for creature collecting. Working together, the Kofim collected dirt, leaves, and the occasional potato bug. Having no fear of these creepy-crawly critters, many of the Kofim helped each other ease into the “new territory” of picking up bugs with gentle hands, watching them crawl up and down arms, and then either placing them in a container or back into its hole. 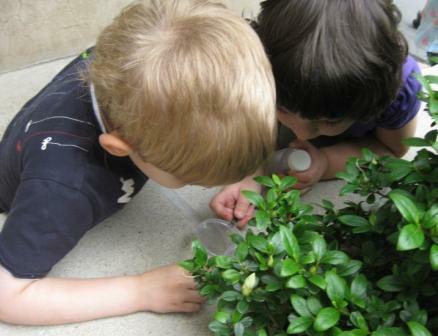 Ants and potato bugs were the ones we brought back to class most frequently, to inspect before putting them back outside “to play,” as the kids put it. One day, a classmate brought in a jar of caterpillars for the kids to observe. Five caterpillars in a jar crawled around as the kids watched and asked questions: “Why don’t they have legs?” “How can they see?” “How can they eat?” “When will it be a butterfly?” Using The Big Bug Book, we looked up caterpillars and read about many different kinds. We also began to focus our creature searches toward areas with lots of flowers, where we would be sure to spot butterflies or moths. The kids were familiar with the idea of making a chrysalis from the ubiquitous and beloved The Very Hungry Caterpillar, but they had never seen it in action. Over the course of the next seven days, the caterpillars grew to be enormous “baby monster caterpillars,” before crawling up to the top of the jar, hanging upside down, and making their chrysalises. We ordered more caterpillars (InsectLore.com), so the kids could watch the process a second time. 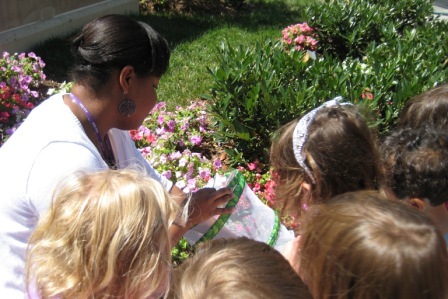 As each set of caterpillars metamorphosed into butterflies, the children were transfixed. They told kids in other classes about their pet butterflies, so we soon began entertaining visitors from all over the school. After keeping each generation of butterflies for roughly a week, we went out as a class to release them in Arna’s Garden in front of the J. As each one flew away, we said “Goodbye, Butterfly,” adding many of the languages we had represented in our class: shalom, parpar (Hebrew), au revoir, papillon (French), adios, mariposa (Spanish). Not done with butterflies yet, the Kofim Class and their parents jumped on the S4 to the Smithsonian Museum of Natural History’s Butterfly Pavilion. We spent the morning watching a tarantula being fed, holding GIANT grasshoppers, and walking through a flower-filled greenhouse with butterflies fluttering above and on our heads. As teachers, it is our job to impart knowledge to the students, to shrink it down in a way that makes it accessible to the kids. The kids are teaching us in reverse, by magnifying their own wonder in these so-called “little things” and sharing it with us. 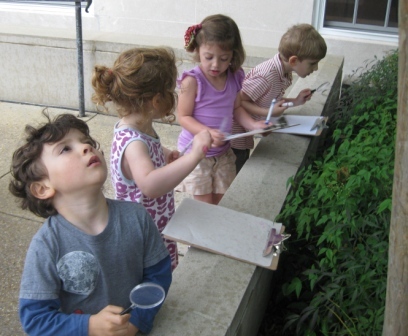 Filed under: Kids and Parents | Tagged: bugs, butterflies, butterfly pavilion, emergent curriculum, Jewish, museum of natural history, preschool, Q Street Preschool, reggio, Reggio Emilia, smithsonian |	Comments Off on What’s Jewish about butterflies? Or spiders or potato bugs? 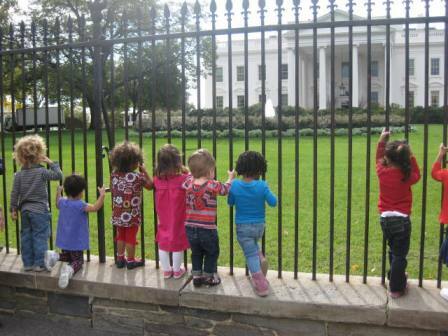 My name is Mandy Sheffer and I am the atelierista at the Washington DCJCC Preschool. Atelierista is an Italian word that translates to studio specialist in English. In simpler terms, I am the school’s art teacher. 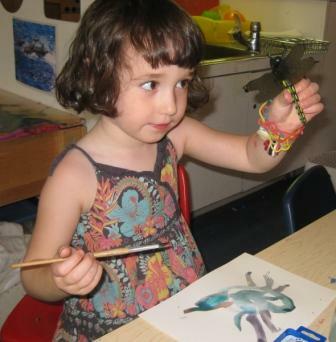 We are a Reggio-inspired preschool, meaning we follow the Reggio Emilia teaching philosophy. Every week each of the seven classes in our school has a one-hour studio session with me in our art studio. This time is a chance for the children to talk, explore, learn and create artworks and projects that are meaningful to them, while at the same time learning new art techniques and becoming familiar with different art styles and artists. “Working from pre-World War II photographs, Mörsel Nathan searches for details of family members, most of whom she has known only through photographs and stories. In working with these images, she creates hauntingly beautiful and provocative works. “Miriam, the artist who created the pictures in the gallery, has a family just like you and me. Some of her family she has never met before. They lived far away, long ago and the only way she knew about them was from a box full of old photos. The photos were so old that they were black and white; there was no color at all. She loved to look at the photos and because she didn’t know anything about the people in the pictures, she loved to make up stories about them. Some of her favorite photos were of her Aunty Greta. Aunty Greta wore lots of different clothes in the pictures, but because the photos were black and white, Miriam didn’t know what color they were. She liked to try and imagine what color Aunty Greta’s dress might have been, or the color of the jumpsuit she was wearing. She decided to paint some pictures of the dress and jumpsuit to help her imagine their color. The children really connected with the exhibit. There was a lot of continued conversation about the artworks, Aunty Greta and Uncle Josef began to pop up in the children’s play and lots of the children wanted to know more about Miriam. The children also began taking their parents to visit the gallery. To build on this interest we continued our gallery-inspired studio work. Over the following four weeks, each class created artworks inspired by the exhibition – visiting the gallery frequently throughout the weeks for inspiration and to gain new insights. 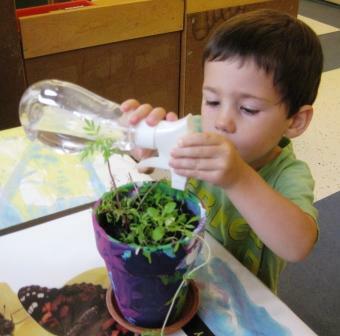 Because we are Reggio-inspired, we wanted to stay true to the approach throughout the process. Having the children guide the direction of the artwork is one way and documentation throughout the process is another. Throughout the creation process, we utilized a range of documentation methods to make the process more meaningful and to highlight the learning that has happened throughout, including written, photographic, audio and video observations. Each class created their own binder, which told their individual journey through written and photographic observations as well as work samples. These were presented alongside the artworks. DAGIM (2 year old’s): The Dagim’s artwork was inspired by the Aunt Greta series and focuses on each individual child and their favorite color. One-by-one each child laid down on a large sheet of white butchers paper and was traced around to create a silhouette of their body. 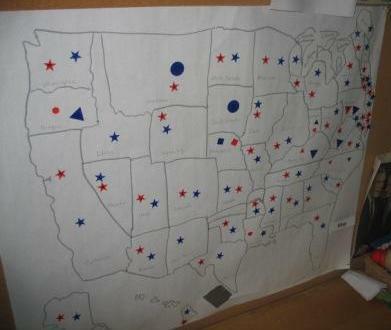 They then chose a color to represent them. For example Oliver said “Aunty Greta is blue. I am red.” We painted our silhouettes using the color that each child chose to represent themselves. We used watercolor paint and brushes for the base color and then squeezed and flicked tempera paint in squeeze bottles over the top of the watercolor. PEELIM (2 1/2 year old’s): The Peelim’s artwork was inspired by the Aunt Greta series and focuses on each individual child and the colorful clothing that they wear to school. We visited the gallery again in small groups and looked at Miriam’s repetitive artworks of Aunty Greta’s jumpsuit. We talked about all the different colors we saw and each child chose what color they thought her jumpsuit really was. We looked at our own clothes that we wear to preschool and talked about what every child was wearing and what color their clothes were. We then headed up to the fourth floor photocopier and took it in turns to photocopy the shirt we were wearing at school that day (reminiscent of the simple black and white images of Aunty Greta’s jumpsuit that Miriam created). I also photocopied an assortment of the children’s spare clothes (namely pants and socks). We used watercolor paper for the copies. We built onto this work by adding color to our photocopies using watercolor paints and small brushes. They finished their art pieces by organizing and gluing their water colored clothing into one piece on a large sheet of paper. RIMONIM (2 3/4 year old’s): The Rimonim’s artwork is inspired by the Aunt Greta series and focuses on portraiture – what Aunty Greta’s face looked like. This class was intrigued by the fact that Miriam hadn’t painted a face on the Aunty Greta silhouettes and we talked a lot about what we thought her face might have looked like. We started our artworks by painting Aunty Greta’s skin – we used large white paper and mixed an assortment of skin-toned tempera paints using different sponges. Next, we shaped Aunty Greta’s head and added the detail to her face. The children’s faces were photographed and their eyes, nose and mouth were cut from their pictures and mixed up together. We drew large circles on the back of our skin-toned paper to represent her head and then cut them out. Using the cutouts of their faces, the children glued and collaged on eyes, noses and mouths. Last, we mounted our faces onto large sheets of watercolor paper and added hair using black markers and watercolor paint. The end results were quite abstract and striking! KOFIM (3 year old’s): The Kofim’s artwork is inspired by the Uncle Josef series and focuses on memories and storytelling. The Kofim spent a lot of time looking at the Uncle Josef wedding photos. We brainstormed all the things that we thought might have happened at Uncle Josef’s wedding and then individually each child talked in more detail about a specific story they thought took place at the wedding. Next, we created small ink drawings (reminiscent to photographs) to compliment the stories we told in the previous week. These were then combined into a wedding album for Uncle Josef. SIPORIM (3 year old’s): The Siporim’s artwork is inspired by the Uncle Josef series and focuses on clothing, perspective and storytelling. This class spent a lot of time studying the group photo of Uncle Josef’s wedding. We talked about the clothes that they were wearing and how they were posed. We decided that at weddings you have to dress fancy and at Uncle Josef’s wedding you had to wear a hat. For our artwork we decided to get fancy and go to Uncle Josef’s wedding too. Choosing from a large array of fancy dress-up clothes, shoes and accessories to get dressed in, the children could wear anything they wanted, but they had to make sure they had a hat. Once dressed and looking fabulous, each child took turns to stand against a white backdrop to pose for a picture in black and white, of their front and their back. Once printed we added our own color using colored pencils and then arranged these pictures to resemble the group photo from Uncle Josef’s wedding. TUTTIM (late 3’s, early 4 year old’s): The Tuttim’s artwork is inspired by the slideshow from the Uncle Josef series and focuses on family, memories and storytelling. Each child brought in an old photo of their families taken before they were born, and in turn told a story about what they thought was happening in in. These were recorded using an audio recorder and combined in iDVD (Apple video-editing software) to create a slideshow of memories. We also talked as a group about our school family. We talked about all the people who make up our school family and together explored each floor of the building to see what school family members we could meet. We took with us an audio recorder, a camera and a list of questions the children had written to ask the people that we met. These recording and photos were also used in our slideshow. The Tuttim were also in charge of creating invitations for the exhibition, creating the menu for the night (pickles, ice-cream, popsicles, bread and apple juice) and curating the artwork. YAELIM (pre-K): The Yaelim artwork is inspired by the veiled images in the Uncle Josef series and focuses on family, memories and storytelling. Each child brought in an old wedding photo from home (of their parents, grandparents etc) and created stories about the images. The photographs were then copied black and white and the children added their own colors using colored pencils. We also created wedding veils using embroidery circles, white netting, large needles and pastel colored embroidery thread. The children created abstract designs with their thread and added in beaded details. The culmination of the artwork was combining all pieces together into a frame to create veiled memories like Miriam did. To showcase the children’s incredible work, and to give a fitting end to the culmination of this project, we decided to create our own gallery in the preschool lobby (aptly named The Preschool Lobby Gallery) where we could exhibit our work. November 10th was our opening night and naturally we threw a party for our families and our JCC family to come and see the work. The Tuttim class were our ‘mover’s and shaker’s’ and helped to plan and coordinate the opening night. They set the menu (pickles, ice-cream, popsicles, bread and apple juice), curated the artworks, packed away the school library from the lobby and made sure that all JCC staff were reminded of the event. On opening night we drew a huge crowd of JCC staff, families, friends and most specially the artist herself, Miriam! The children (and teachers) were so proud at what they had achieved and we were all honored and excited to have Miriam join us. Some found themselves tongue-tied when they got to meet her, while other children grabbed her hand and took her to look and talk about the artworks they had created. Miriam’s art has been incredibly inspirational for all the children and teachers, acting as a catalyst for strengthened relationships within the school, the centre and with our children’s families. Aunty Greta and Uncle Josef have become so important to all of us that they will never be forgotten – they are part of our families now too!